When my oldest was in elementary school, I was a room mother. For holiday parties, I always got to have fun planning the craft. This is what we made for her Halloween craft in 5th grade. Aren't they cute? They're made out of toilet paper!!! 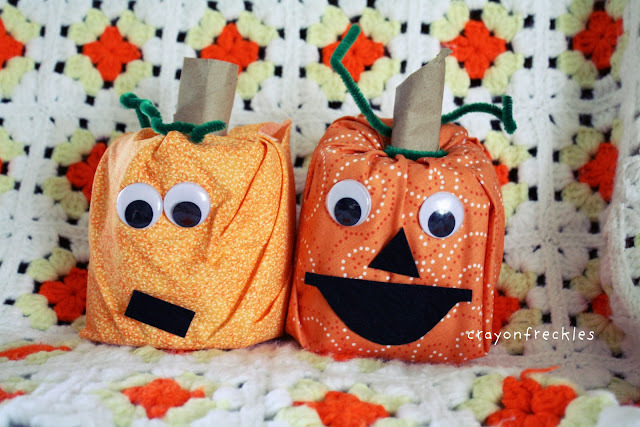 So I thought we'd resurrect the project and make some more toilet paper Halloween buddies in pumpkin and monster varieties. 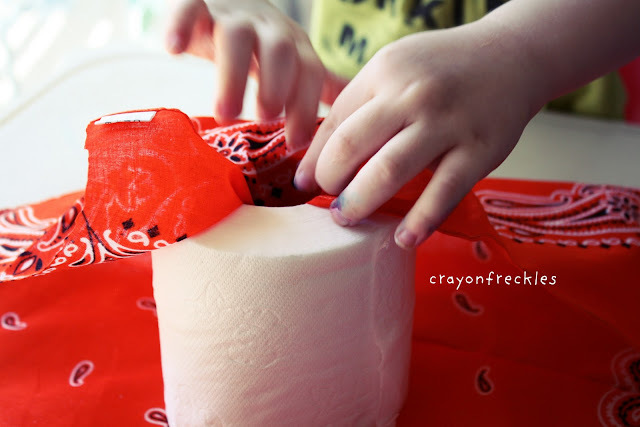 After cutting the colored fabric into 10x10 pieces, sit the roll of toilet paper in the middle of the square and shove the fabric into the hole on top of the roll. When Bear was done with the pumpkin, he rolled up a piece of brown cardstock and stuck it in the hole as the stem. Not sure why I didn't take any shots of him making the frankenstein.... But it was fun to watch him put the witch together... Especially dealing with all the pieces of rick-rack for her hair. Which one is your favorite Halloween toilet paper buddy? How cute! 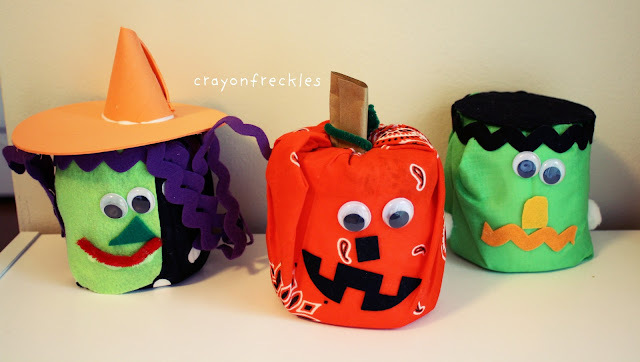 Love the pumpkin, a nice kiddie friendly craft, although mine would still try to tp the entire house first! I love them all-how could I choose? awh how cute! I love them! Thank you so much for sharing and for linking up! I love the pumpkin! Thanks for linking to Things I've Done Thursday. Haha this is the cutest toilet paper has ever looked! Another great idea from you! So, so cute. I love how you've taken the TP pumpkin and kicked it up a notch. This is such a wonderful idea! Thanks for sharing it Andie. Your skill at turning the everyday into learning is amazing. You inspire me kiddo! Tell the bubs I said "Boo!" Love these!!! I love getting the kids involved!! These are so cute! 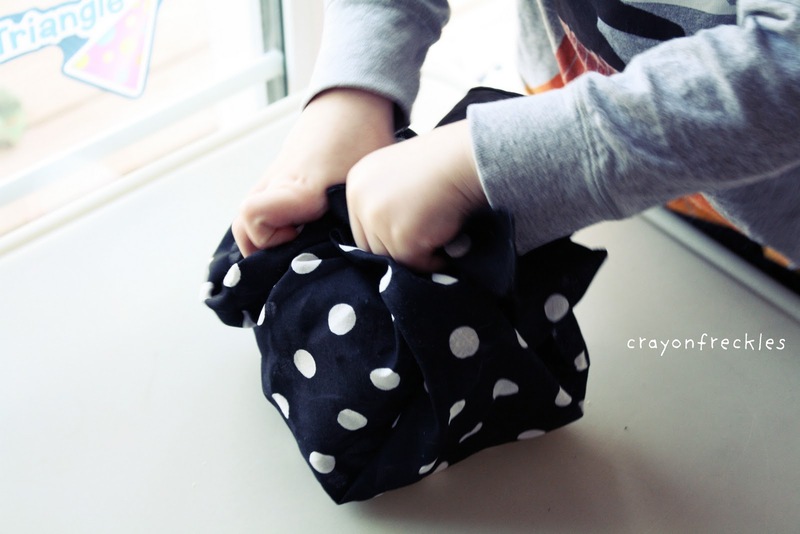 And such a great project for the kiddos. 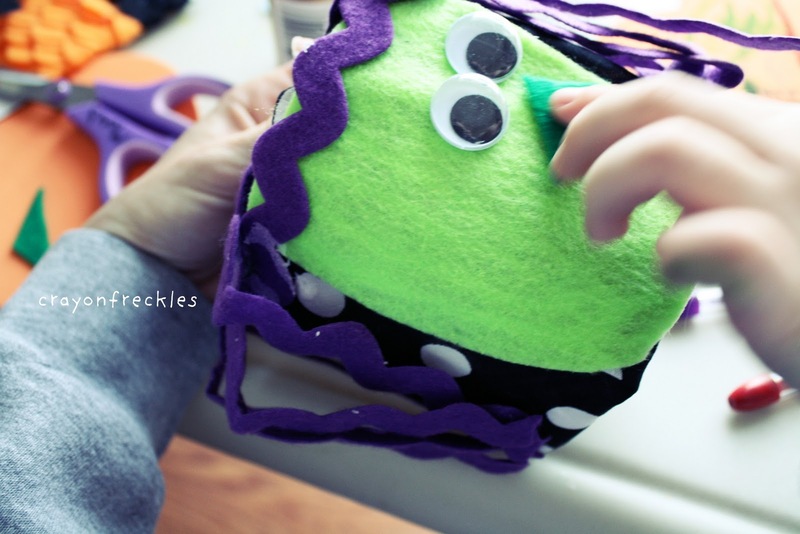 Thanks for linking this up to my Monster Mash Bash! Oh.my.goodness!!!! Love, love love!!!! The witch is my favorite. I have a thing for witches lol. Wondeful idea for kids! They are just adorable. adorable!! those are so neat. great idea. thanks for sharing on momstown arts and crafts! 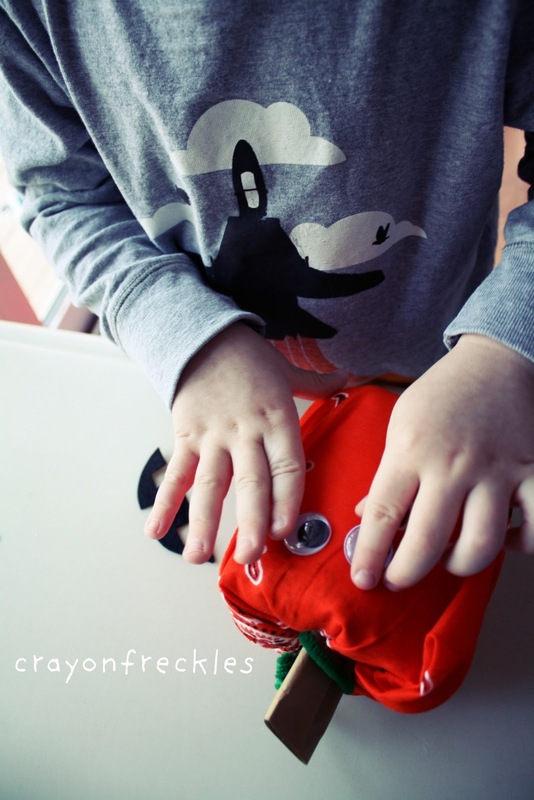 Thanks for linking up, we featured you as one of our top 10 crafts on our Halloween linkup! sooo cute! Can't wait to do this with my little ones! The Pumpkin is definitely my favorite! I love this craft because the kids can do it all by themselves and it turns out really good. It's ridiculous how cute this is. I love it Andie! Very original, simple, and fun! These are hilarious! So cute. Pinning it on my Recycle board. oh how fun!! will have to give it a try this week for sure! Andie...these are just fantastic! You put a smile on my face...i think witchy poo would be my favourite....i am a sucker for rikrak and a hat!